This is my preferred solvent. In spite of it being odorless, I strongly recommend having adequate ventillation when using an open container of this. I would not skimp on this, although you can recycle it over time, you will go through a lot of it, and it pays to purchase a larger container. Just wet brush and work up a lather on hard cake. Even old, hardened oil paint brushes can be restored to original snap. Also for most acrylics and watercolors. No harmful fumes or odors, safe for classroom or studio. This is the second type of soap I use for cleaning my brushes. 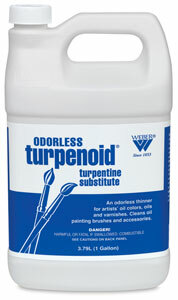 This one works particularly well to free up brushes that have dried or nearly dry oil paint on them. 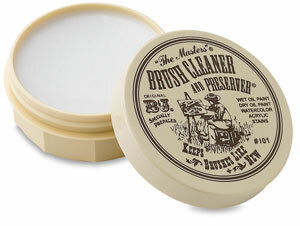 It is less abbrasive than The Masters Brush Cleaner. The third type of soap I use is regular Soft Soap, particularly for my softer brushes. This versatile linseed oil soap is an excellent brush cleaner and moisturizer that can also be used to clean your hands. 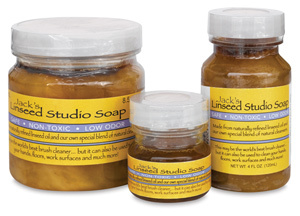 Jack’s Linseed Studio Soap’s minimal odor makes it ideal for classroom or studio settings.